HONOLULU (Sputnik) – At least 26 homes have been destroyed by lava as ongoing eruptions from Kilauea volcano continue to threaten residents and property on Hawaii’s Big Island, the Hawaii County Civil Defense Agency said Sunday. "Unfortunately, we're up to 26 residences that have been taken out," the agency representative said at a press briefing streamed live on the Civil Defense Facebook page. The Hawaiian Volcano Observatory confirmed that two more fissures emerged in a residential subdivision on the east rift zone of Kilauea volcano, bringing the total number to 10, though one has already gone dormant. The residents of two subdivisions, Leilani Estates and Lanipuna Gardens, were put under a mandatory evacuation on Thursday, following a number of lava eruptions in the Puna district of Hawaii Island, the largest of the Hawaii islands in the Pacific Ocean. On Friday, a 6.9-magnitude earthquake, the strongest in Hawaii since 1975, led to the closure of Hawaii Volcanoes National Park and temporarily knocked out power, affecting about 14,000 customers, according to electric utility company Hawaii Electric Light Co.
May 6, 2018: Aerial view of Leilani Estates, Hawaii Island. The US Geological Service (USGS) warned on Saturday that additional fissure outbreaks with spatter and lava flows were likely, although the locations could not be predicted with a high degree of certainty. According to the USGS, eruptions and earthquakes could continue for months. Hawaii County Civil Defense said that county, state and federal partners would continue to monitor the situation and inform the public should further safety concerns arise. Kilauea volcano, which has been erupting continuously since 1983 and is one of the most active volcanoes in the world, has shown signs of increased activity over the past week, which led to hundreds of small earthquakes. Following the opening of the first lava vent on Thursday, Hawaii Governor David Ige activated the Hawaii National Guard to support emergency and evacuation efforts, which have so far affected about 1,700 residents. 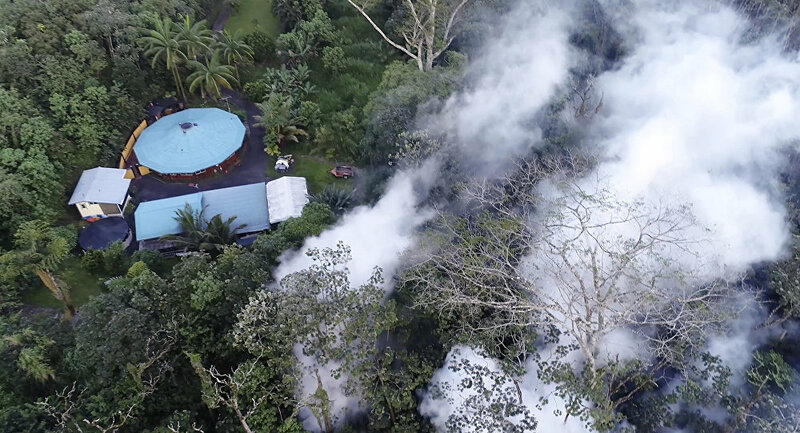 The governor also signed an emergency proclamation, which authorizes "the expenditure of state monies as appropriated for quick and efficient relief caused by the volcanic eruption," according to the governor’s office.